Networking at the TEDxMidAtlantic event. Photo by Christiana Aretta. On Friday, TheCityFix attended TEDxMidAtlantic, an independentally organized event of speakers who give short and poignant presentations on their field of expertise. The local event, held in Washington, D.C., is modeled after the annual TED Conferences, which feature “Ideas Worth Spreading” from people who must “give the talk of their lives” in less than 18 minutes. The cost to register for this year’s annual conference in Long Beach, Ca. is $6,000, and tickets are already sold out. Fortunately, the TEDTalks are made available online for free. The purpose of TED, which stands for “Technology, Entertainment and Design,” is t0 spread good ideas and inspire. The local TEDx Events, which includes the participation of cities from Boston to Beijing, disperse this wealth of ideas in a more affordable and condensed way. 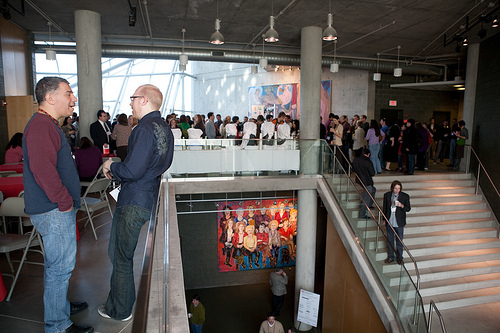 The theme of TEDxMidAtlantic 2010 was “What If?” The topics discussed included population growth, climate change and urban planning. The goal is to bring together thinkers, activists and other people who to make change. We wanted to share a bit from two speakers whose work and art is relevant to sustainable cities. Otis Rolley gave a short talk about a city close to home: Baltimore, Md. (We recently wrote about demographic shifts in the city.) Rolley was the founding president of the Central Maryland Transportation Alliance (CMTA) that works to build better regional transportation in the Baltimore metropolitan area, including a “coordinated system of highways and interconnected mass transit options.” While at CMTA, Rolley oversaw the publication of a transit-oriented development study, supported the proposed Baltimore Red Line, and pushed for ride sharing options in the region. He now works at Baltimore’s Urban Policy Development, a public sector management consulting firm. Of Baltimore, Rolley said the “Sim City approach” will not bring change to the city. Considering the blight that afflicts acres upon acres of the city, starting from scratch ignores Baltimore’s existing social networks and urban fabric. Rolley said cities should be “taken care of,” referring to the vacant neighborhoods that he said should not be torn down but invested in. Given Rolley’s previous work, he thinks transportation would be an important step in moving the city forward. Not to mention that Baltimore’s blocks of rowhouses are totally irreplaceable in architecture, quality and feel. 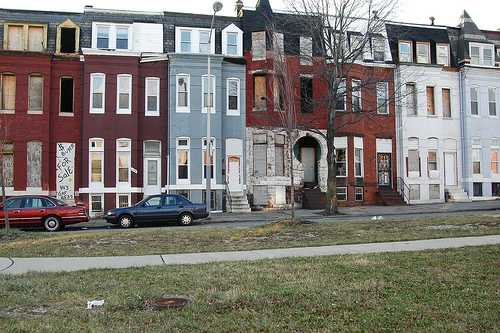 Baltimore's iconic rowhouses. Photo by Elly Blue. Are sites like these an aesthetic pursuit, a mathematical accident, a calculated bending of property lines based on glitches in the local planning code or an emergent combination of all these factors? Or are they the expression of something buried deep in human culture and the unconscious, something only visible from high above? Gielen pointed out that sprawl traps us in our personal bubbles of homes and vehicles. 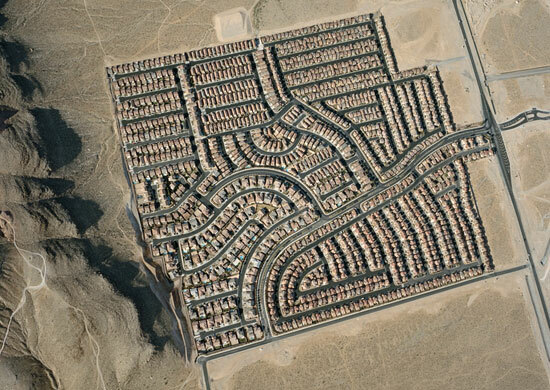 One development in the middle of the Nevada desert appeared from above to be a rectangle of similar looking rows of homes with streets and landscaping that looks like a prison itself; it sits in the middle of nowhere with only two exits. His photograph is shown below. Gielen photographed a housing development in Nevada with only two exits. Photograph by Cristoph Gielen. Gielen also has an interesting method for choosing the areas he photographs. He looks at places with the highest rates of housing foreclosure, usually a good indicator of sprawl, Gielen says. This past year, those states have been Florida and Arizona. Bottom line: This kind of free-for-all construction is linked to both fiscal and environmental irresponsibility. You can learn more about some of the other speakers here.